BOCA RATON, Fla. - Sept. 27, 2018 - PRLog -- The Unicorn Children's Foundation is delighted to announce the finalists for the Special Needs Advisory Coalition (SNAC) of Palm Beach County 2018 Community Inclusion Awards. These unsung heroes, who were nominated by the community and evaluated by a group of independent judges, are recognized for their efforts at building a better and more inclusive community for individuals with special needs and their families in Palm Beach County. The winner in each category will be announced at a luncheon sponsored by Unicorn Children's Foundation on Wednesday, October 10, 2018 at Boca West Country Club. Congratulations to all of the finalists who embody excellence, integrity and passion in providing support and services to the 12% of residents who have one or more special needs/disability. 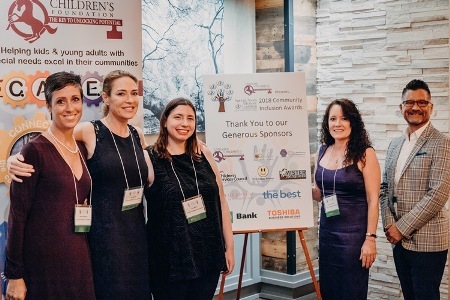 All nominees are being considered for the TD Bank Community Choice Award which will be determined through online voting through October 5, 2018 at www.unicornchildrensfoundation.org Tickets are $75 per person and exhibitor tables are available which include a ticket to the awards luncheon. More information is available by calling (561) 620-9377 or visiting our website w (http://www.snacawards.org/)ww.unicornchildrensfoundation.org. Unicorn Children's Foundation is a 23 year old non-profit organization that is dedicated to building communities of acceptance, support, and opportunity for kids and young adults who are challenged by special needs and neurodiversity by supporting or developing its cradle to career pathways. Our initiatives connect families to community resources, advocate for inclusive opportunities, respect differences, empower individuals, and support success. With 1 in 6 children being diagnosed with a developmental or learning disorder, we believe it is our responsibility to create a world where all children's potential can flourish. To learn more about the Unicorn Children's Foundation visit http://www.unicornchildrensfoundation.org. Also available on Facebook and Twitter.